RECORD temperatures are placing a severe strain on the nation's cattle industry, slashing prices in three states as the intense heat kills cattle and calves in western Queensland. Damn, I hate to read something like this. Australia might be a competitor for market share but I hate hearing about cattle dying like this. For those of us that are Celsius challenged 40 degrees Celsius mentioned in the article is 104 degrees Fahrenheit. 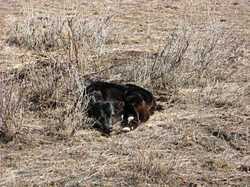 This calf truly thinks he is hiding from me in the sagebrush. It wasn't working real well for him. Taken 3/15/2007.